SIT partners with Emerson Damcos & Dantorque valve remote control technology to provide valve actuation for customers in various marine applications. As the exclusive partner for Emerson offshore applications, SIT has the local presence to provide excellent customer support as well as the backing of a globally recognized manufacturer. Damcos (Emerson) valve control and automation systems seek safety and reliability in a compact, durable design while allowing a high degree of customization with their modular platform design. SIT is valve neutral so can work with your preferred valve to specify in your system. We can provide solutions with different types of visual signals on actuators as well as options for local power units to make operating your systems easier, increase the lifespan of your equipment and simplify preventative maintenance. We can provide a complete package for your fluid power in marine with our ability to supply hydraulic power units, tank radar, water makers and fluid separation systems. With one point of contact for all of these systems on your vessel/platform, we make the process and ongoing support easy for your team. Hydraquip partners with Emerson Dantorque, Schaffer and Bettis GS for subsea valve actuator solutions. These three product lines (now all part of Emerson) each have over 25 years of expertise in producing specialized subsea hydraulic valve automation and controls. Bettis GS – The symmetrical scotch yoke mechanism provides quarter-turn rotation. GS-Series actuators are available with diver or ROV intervention systems. The actuators are well suited for riser and other fail-safe applications. Dantorque – Suited for subsea, very compact and fully concentric, thanks to the helical spline drive mechanism and disk springs – the proven design provides space savings and reliability Available in double-acting and fail-safe, spring return configurations. Schafer – Shafer rotary vane actuators produce balanced quarter-turn torque without the need for any internal gearing or power conversion mechanism. The actuator is extremely efficient and compact, and does not require pressure compensation. The rotary vane actuators are excellent for manifold and other tight space applications. 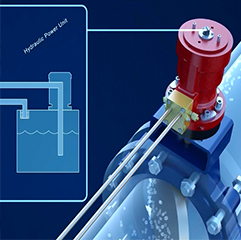 Operating System – a single-point overview of all valve and actuator positions throughout the vessel, and the same system is used for hydraulic and electrohydraulic solutions. Power unit or Local Power Unit Options – built on a standard modular platform, possible to configure and scale the unit as requirements demand. The LPU option reduces the chance for contamination in the system and is a more economical option to install. Actuators – set the benchmark for marine industry valve operation and control. The key is a patented design that uses a helical spline system to deliver high torque without the need for large size. Control cabinet – standardized solenoid valve cabinet, able to support up to 120 valve controls per cabinet. Each valve can be isolated and independently controlled, thereby reducing downtime and making repairs easier. If you have any questions or need assistance, feel free to call our offices during our business hours of 8:00 am - 5:00 pm CST Monday thru Friday. You can also fill out a contact form below and we will get back to you as soon as we can.